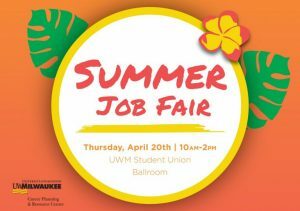 The UWM Career Planning and Resource Center will host its Summer Jobs and Internship Fair April 20 from 10 a.m.-2 p.m. in the Union Ballroom. This is a great opportunity for students to find full and part-time summer jobs and internships and earn money to help pay for school! Students can opt to apply for on or off-campus positions, or both and spend the summer earning money, maybe taking a class, getting some sun and having fun. AND, if you already have that summer job lined up but want to work on campus this fall, the on-campus employers will also be doing hiring for the fall semester! Come dressed for an interview, resume in hand, and elevator speech prepared! See the staff at Career Planning & Resource Center to learn how to make the most of this fair!